It’s actually easy to use. You don’t need to be a database administrator or techie to make it work for you. Most of the SIS’s out there are just good enough to get the job done, but take awhile to learn and can still be challenging. Why should we as educators settle for that? We are increasingly accustomed to using extremely intuitive software on our smart phones, tablets, and laptops. Why shouldn’t our school and district management tools be just as intuitive? We deserve this. It saves a ton of time for admins and teachers. We all know how stretched for time we are. If a system’s tools and ease of use can save us just 30 minutes a day, wouldn’t that be a huge win for both educators and students? Think of the positive impact on educator happiness and work/life balance, not to mention the potential gains for student improvement as a result of reclaimed time to focus on students. Many in the K-12 space don’t think an SIS can impact student outcomes, but when you consider the potential time savings for teachers, it can actually have a huge impact. It saves schools and districts money. With most schools and districts using up to ten different systems serving niche needs to operate, a lot of time and money is spent trying to integrate and connect these systems to each other. Because Alma offers SIS, LMS, and communications tools in a single platform, business managers and principals save big by consolidating. And much less is required to be spent on training due to the ease of use. It fosters communication like no other. Alma has woven communications tools into virtually every aspect of their SIS and LMS, so that you don’t have to leave whatever you are doing to engage any member of the community in seconds. Building these tools right into the workflow increases efficient communication, and we all know how important that is for success. 'All in one' is the future of school management software. Think about it. How many different tools do you have to remember and save passwords for, not to mention learn how to use? It just doesn’t have to be that hard. With more capability in a single platform, you have less to learn, fewer disparate places to go to get things done, and a simpler existence. Why pass the data though so many systems and put data privacy and security at risk in the process? It’s like going to the doctor’s office and filling in the same information on so many different forms – it just doesn’t have to be that complicated. These are the big reasons I’m so excited about Alma. 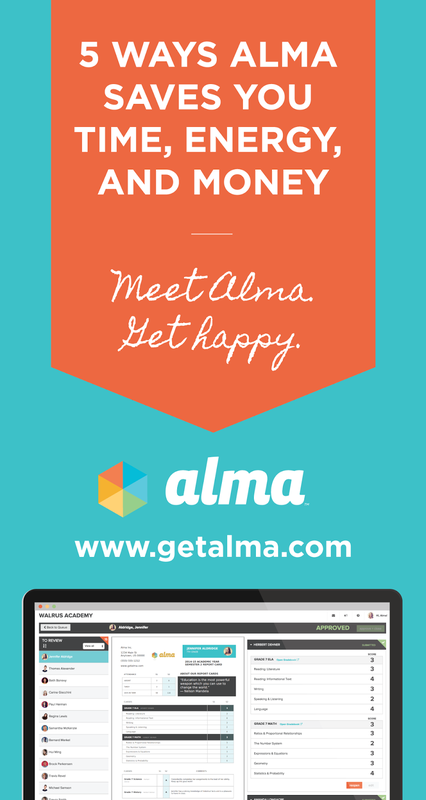 But don’t just take my word for it – I encourage you to see for yourself at www.getalma.com and requesting a demo. It’s unlike anything else you’ve seen – in a good way.